Restoration projects must confront the work of art on two levels: as an object and as a text. The object that is the artwork is physical; it is described with phrases such as medium of composition, state of decay and environment of display. In short, this is what you see. The text that is the artwork is cognitive; it is described with terms such as narrative, meaning and purpose. In short, this is what you think. This dual nature presents a challenge to the conservator, whose responsibility is authenticity as much as it is preservation. While pursuing authenticity is relatively straightforward vis-à-vis the work of art as an object, its text poses obstacles. The reason for these difficulties is the common assumption that an artwork’s textual properties are distinct from its object. However, just as the objective characteristics of an artwork affect our understanding of its narrative, so too do these later subjective characteristics of meaning and purpose affect our understanding of the object itself. They do so by directing our observations and making us recognize the importance of certain objective facts over others. Applying this rubric to the restoration of Art Thompson’s Boo-Qwilla totem pole makes this paradigm all the more clear. For the sake of argument, I will choose the two most extreme options for a conservation project: doing nothing to the artwork (i.e. championing the original text) vs. recreating the artwork as it was created (i.e. championing the original object). 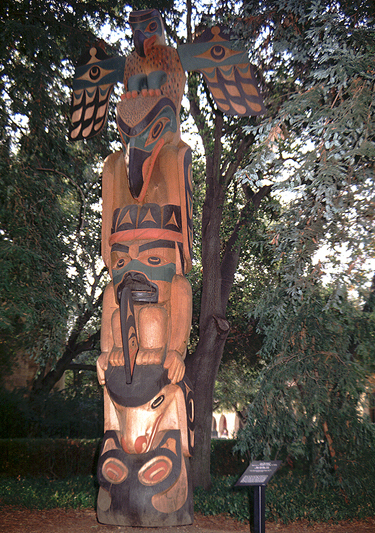 On the one hand, if the museum were to recreate the pole as it was originally created, it would be ignoring the role that decay plays in the function of totem poles to their traditional makers. Indeed, a common criticism of the conservation of totems is that they are designed to rot and return to the earth. On the other hand, if the museum were to do nothing and let the totem deteriorate for all to see, it would be ignoring the productive capacity of the original object. The evocative and surreal anthropomorphism of animals, the compelling narratives about the creation of the world and humanity, the mystical and symbiotic relationships between the pole’s carvings, these textual characteristics are truly sui generis and would be lost if the object was left to rot. The reason why both of these extreme positions have a rational claim on the decision making process is because they both appeal to necessary components of the work of art: one to the object and the other the text. Ultimately however, what they demonstrate in their opposition is the necessity of compromise. It is important to note that the museum chose Art Thompson because he carved totem poles—objects—which act much like any other work of art—textually. He was not chosen because he made totem poles that functioned anachronistically—that is for a different time. If he did, I would agree that conservation would not be appropriate. However, Thompson was chosen because the textual characteristics of his poles are extremely poignant in the present. And because of the role that the present continues to play in the life of Boo-Qwilla it should be conserved both as an object and as a text. traditional rebuilding of two Shinto shrines. Coaldrake writes how both objects retain their historical significance (i.e. their stories) and authority even though they are remade every twenty years. Thought this would be an interesting example of how text and object can also relate. I like how your argument proposes opposite criteria for conservation assessments without introducing investment considerations. Your post highlights one of the subtle differences between a university setting, which deals in ‘cultural assets’, and the private sector, which tends to treat artworks more as monetary assets.